Mindflux proudly presents the next generation of Interactive Personal Displays (IPD), the “VFX3D”. The VFX3D is a high quality IPD system complete with an integrated three degree of freedom tracker for roll, pitch and yaw positioning, standard VGA interface, audio inputs and 360,000 pixel colour display. Designed with the customers needs in mind; the VFX3D supports design packages such as 3D Studio Max, Sense8, Realimation and others. With use of the optional CyberPuck this new technology allows users to interact and work within their environments first hand. Enter your worlds with a first person perspective. Explore your surroundings by simply moving your head and navigate through these worlds with full stereoscopic images with most DirectX titles. With the VFX3D’s advanced VFXLauncher program running applications have never been easier. Simply click on the application you want to use and we do the rest. Have complete control of all your video settings with the new VFX3D on-screen display controls. With control settings for your volume, contrast, brightness, color, tint, and stereo modes. Easily adjust tracking through the VFX3D control panel and your ready to Step Inside many of your favorite applications, with a growing list of today’s top releases. VGA pass-through for monitor support. Fixed focus optics (no IPD required). No Internal PC card required! 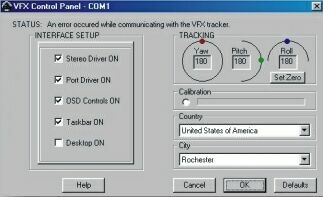 The VFX3D has a completely updated tracking system with improved performance over the VFX1. 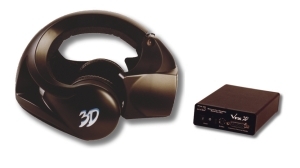 Stereoscopic support for most Direct3D games and applications. Optional USB compatible interface for tracking the and control interface. 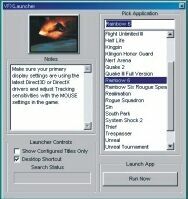 Using the latest v2.0 Launcher, you can now configure any games to use to the VFX3D. All your favourite games like Deus Ex, Soldier of Fortune, Thief 2, Doom3, MDK2, Daikatana and anything else!